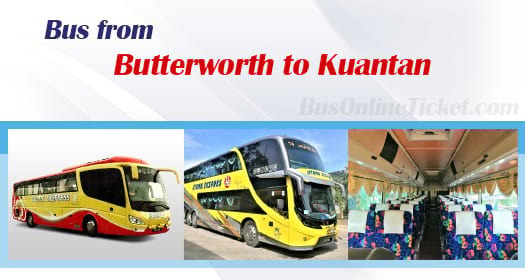 Bus from Butterworth to Kuantan is a reliable and enjoyable bus service to allow people to travel between these cities. Because there is no train and flight services available for this route, bus become the only option to travel from Butterworth to Kuantan. Utama Express and Pacific Express under Hee Enterprise management are two bus service providers offering bus from Butterworth to Kuantan. There are only total 3 daily departures from Butterworth to Kuantan. Pacific Express provides 1 departure in the morning and evening, while Utama Express only have 1 daily evening trip. Utama Express is operating this service with Double Deck VIP coach. Utama Express is the preferred choice among commuters because of spacious seat and big bus. As for Pacific Express, it deploys standard VIP coach to serve passengers. The bus journey from Butterworth to Kuantan takes approximately 8.5 hours depending on the weather and road traffic condition on the departure day itself. At least one stopover will be given along the highway. Any needs for additional breaks can request the bus driver during the journey. The bus fare from Butterworth to Kuantan is priced in a range from RM 56.40 to RM 63.00 depending on your selection of bus operator. The boarding point for bus going to Kuantan from Butterworth is located at Penang Sentral Bus Terminal. The arrival point in Kuantan is located at Kuantan Sentral Bus Terminal. With limited bus schedule from Butterworth to Kuantan, passengers are advised to book their ticket online. Everyone now can book your bus ticket online at BusOnlineTicket.com with instant confirmation. Passengers could save their time and money to go bus terminal in advance purposely just to buy ticket over the counter.